The large size includes one 120mm fan and accommodates Extended ATX (EATX) and smaller motherboards. 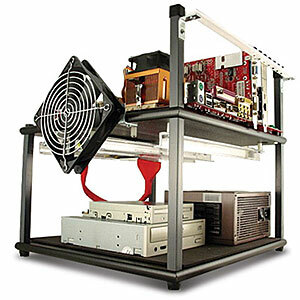 The HSPC Tech Stations are fast-access computer cases... hardware workbenches that bring PC components within easy reach but keep them safe and secure. Their solid, non-conductive construction makes an outstanding test bench with tool-less mounting for PC components, including ATX motherboards, expansion cards, hard drives, power supplies, optical drives and more. Assembly required.